Providing samples is an involved process. The chemicals have to be stored correctly prior to decanting. Technicians must be trained to handle these substances safely. The right type of packaging must be used depending on the sample. An up-to-date health and safety data sheet must be included. All labelling must meet the legal requirements. Finally, the accompanying paperwork must be filled in correctly by trained personnel before the courier company will agree to deliver the package. Chemical companies that regularly send out hazardous samples from UK or China by overseas carriage have three options if they are to ensure all samples are dispatched legally. Firstly, they could set up and train a team in-house to handle sample requests. This can be costly and time consuming. Secondly, they can enlist the help of one of the major courier and freight forward companies to complete the relevant paperwork on their behalf. This is typically very expensive. Thirdly, the company could look to outsource the process to a company that offers a dedicated sample management service. This is often the most cost-effective option. For many companies it is simpler and more cost-effective to outsource the process rather than invest in the recruitment and training of staff, not to mention temperature controlled storage areas, clean rooms and laboratory facilities for handling the chemicals and extra space to keep a supply of packaging materials. On many levels an outsourced sample management service can be much more efficient than in-house sampling. At SampleRite we have a web-based password protected 24/7 ordering facility that allows clients to log sample requests from their customers. Subject to stock availability we can then send samples out within 24/48 hours. At the end of each month we also prepare management reports so our clients can see exactly where their product has been sent. SampleRite currently dispatches over 60,000 samples each year on behalf of its clients, who benefit from the high volume discounts on freight costs that the company has negotiated with the major courier companies. Across the company we handle a variety of hazardous and non-hazardous chemicals including dyes, corrosive, toxic and flammable products, food and pharmaceutical grade. This allows clients to focus on their core manufacturing, distribution and sales activities. Companies involved with the transport of chemicals need to be aware of the various international transportation regulations and the specific training that employees are required to take. IATA’s Dangerous Goods Regulations cover the transportation of dangerous goods by air. The IMDG code covers transportation of dangerous goods by sea and ADR covers transportation by road. To send any hazardous sample overseas requires the product is first identified with a four-digit UN number. There are 3500 UN numbers listed and published as part of the Recommendations on the Transport of Dangerous Goods, also known as the Orange Book. 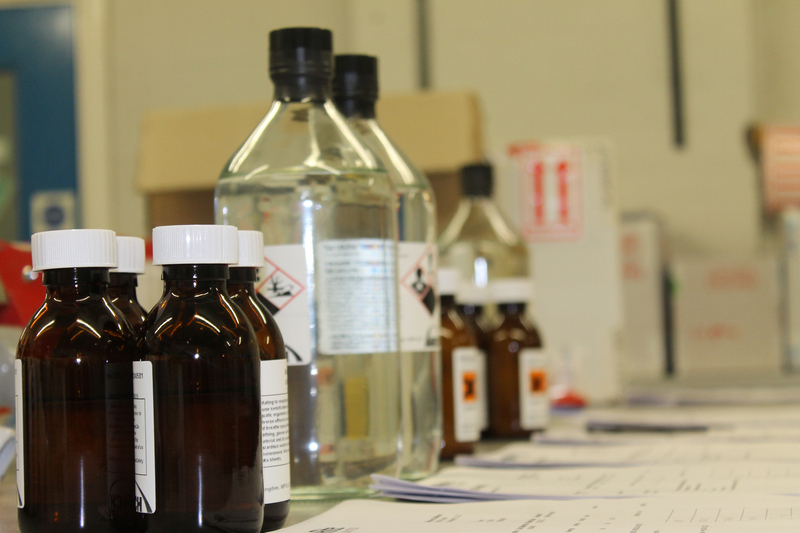 IATA’s Dangerous Goods regulations have recently undergone sweeping changes that impact how samples must be classified and packaged. Companies and individuals that fail to fully comply with the current rules are subject to severe and unprecedented enforcement actions. It is now more critical than ever that anyone involved in shipping samples is fully trained and up-to-speed on the latest standards. The dangers posed by fake or counterfeit safety products from the Far East has received plenty of column inches in the media recently, but there is an equally worrying development in the chemical industry that is managing to slip under the authorities’ radar. Small samples of hazardous chemicals are being regularly packaged and labelled as non-hazardous substances by some manufacturers in order to avoid the additional cost and paperwork required to comply with International Air Transport Association (IATA) and IMDG Code regulations for the transportation of dangerous goods by air and sea. Health and safety is being compromised to save money and the consequences could be fatal. The majority of chemical samples are transported internationally via passenger aircraft and many airlines are unknowingly handling flammable and toxic chemical samples labelled incorrectly. The practice is putting both airline employees and passengers at risk, not to mention those taking delivery of the samples. Anyone opening a package that they believe contains non-hazardous chemicals could be exposed to dangerous liquids, powders or fumes. Workers are unlikely to have taken adequate precautions or to be wearing the correct personal protective equipment (PPE). The problem is getting worse with the shift in chemical manufacturing from its traditional base in Europe towards sites in Asia. For instance, many of the world’s major chemical companies today source from China and have operations in the region or outsource production to Chinese manufacturers so that they can compete in an increasingly price sensitive and commoditized market. This means more and more samples are now being sent overseas in order to drive sales. Unfortunately, many samples coming out of China are being shipped under false pretenses. Procedures are in place within China to stop this happening. All chemical products (both hazardous and non hazardous) must have an identification certificate before being accepted by the airlines. Certificates are issued by a testing body such as DGM or the Shanghai Research Institute. Unfortunately a loop hole exists whereby the hazardous product is labelled incorrectly and a non hazardous identification certificate is used to fool the authorities and keep costs to a minimum. The practice is widespread and many Chinese companies openly admit to incorrect naming and labeling of product to facilitate ease of overseas transportation via couriers and therefore reduce costs. The fact that sample management is not a core function for most chemical manufacturers and distributors is clearly exacerbating the problem. All products have to be sent away for certification before being decanted in controlled conditions, packaged correctly, labelled in line with current legislation and shipped via approved transport companies. All this takes time and money. Given the costs involved, when companies carry out procedures themselves, many cut corners to save on shipping fees. The difference between sending hazardous samples legally and illegally between China and say mainland Europe can be as much as 500%. Should an incident occur due to incorrect packaging, labeling and paperwork or the sample is stopped at customs during a routine check up, the manufacturer or distributor concerned could face prosecution and severe financial penalties. The European chemical company that asked this manufacturer or distributor to dispatch samples on their behalf could suffer irreparable damage to their reputation in the market. Read all about some of the complexities and challenges you may come across.